Supporting sport in Godalming and surround villages. This is what we deliver with the objective of encouraging participation in leisure and sport. Sport Godalming hosted its 2018 Sports Awards at the Wilfrid Noyce Centre in Godalming on Friday 26th October.This event celebrated the year of sporting excellence with winners spanning the generations. See our website for full details. This is a three-level event with a fun run of 1k for families, and 5k and 10k distances for the more serious runners so everybody is catered for. The seventh Godalming Run took place on Sunday 13th May and was supported and organised by Charterhouse Club, Sport Godalming, Waverley Harriers and Godalming Town Council. 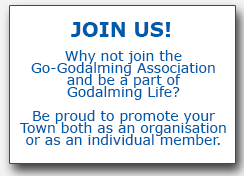 A summary of the event can be found by visiting www.godalmingrun.org and full details of the 2019 event to be held on Sunday 19th May are there together with registration details. Sport Godalming launched its ‘Go for Gold Champions Fund’ in 2007 specifically to give financial support in the form of grants to any local athlete who had reasonable aspirations to be selected for the GB Team 2012. ‘Go for Gold – The Road to Tokyo’ applications close for this year on the 28th February - details on our website. Leisure and sport can be expensive and to assist individuals, mainly younger persons, we make small grants - for example for training costs (including travelling), competition costs and specialist clothing. See our website for the application form. First class facilities are absolutely vital these days for leisure and sport so we want to ensure as far as we can that the Godalming area is adequately supplied with facilities that are needed. If we find a need then we use our contacts to discuss things and to find a solution. By supporting us you will helping our local sports people to develop their skills and to encourage them to have a more active and healthy lifestyle as well as our activities to support the provision of first class facilities for example the new leisure centre in Godalming.